Calibar Signature Packages are designed for those clients who require the sleek and elegant white DJ setup for their events. 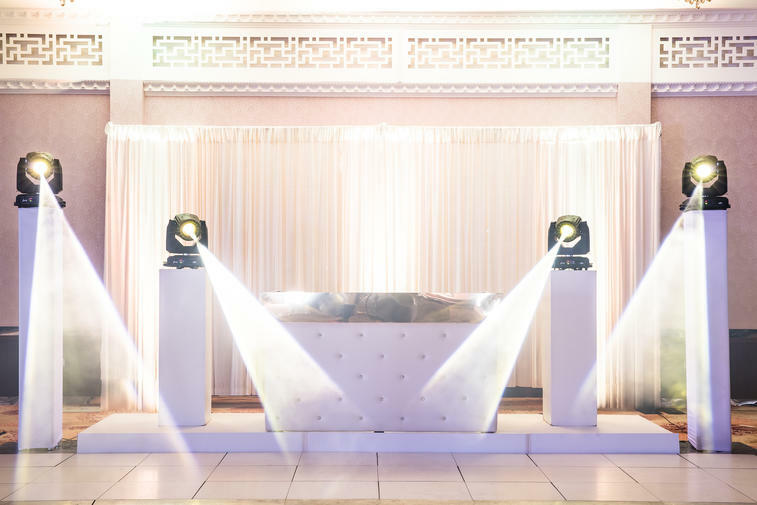 The packages come as standard with a White Chesterfield Booth with a choice of Gold or Silver Mirror bezel, White Stage, White Backdrop and Lighting pillars. The Signature range creates an understated look at your venue and compliments most decor themes. Due to its versatility, the Signature range has become increasingly more popular in recent times. The Signature Essential Package does not come with any audio visual equipment. The Signature Plasma Package comes inclusive of Two Plasma Screens. The Signature Projection Package comes inclusive of Two Projection Screens. Our picture gallery below illustrates the entire Signature range. Please contact a member of our team on 01753 644648 for any further information on our packages and services that Calibar can offer for your special event.